Sometimes we get to offer you great deals on great things. Not today. Today's Dealz inbox was a desert. Amidst the tumbleweed: mediocre deals on useless crap. 18-percent off an LED longboard. Who cares. 32-percent off a piece of furniture that looks like a velvet whale had relations with an Airstream Trailer. Discount that monstrosity all you want, nobody is buying it. 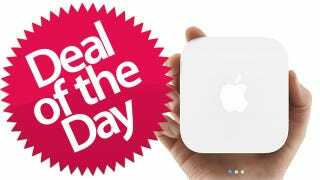 Then there's 10-percent off Apple's new Airport Express. Ten bucks. Not a lot of scratch saved, I know. But would you rather have a giant velour turd or a decent piece of kit? Thought so. You're welcome. - JB.